This issue of Magic Bricks is interesting. If the bricks were placed in the correct orientation to the mummy, and have some inscriptional relation to Akhenaten, doesn't that suggest whoever put them there thought Akhenaten was the mummy in the tomb at some stage and had oriented them accordingly to protect him from evil? I suspect, no enemy would do that, would they? Also, would someone who was not an enemy of Akhenaten want to orient them correctly unless he was confident it was Akhenaten? Reading through this site, it appears there is a lot of support for the idea Smenkhare was the mummy in the tomb. I'm not sure why. * I'm not one of those that believes Neferneferuaten and Smenchkare are the same person, as you may have noticed. I thought the most recent examinaters of the mummy came to the conclusion that the body could be old enough to be Akhenaten? They did, but I find their evidence to be less than convincing. The recent examinations actually confirmed most of the previous ones' findings that multiple features like the wisdom teeth and bone sutures point more towards a younger age (in the 19-23 range, if I recall correctly). The argument that 'KV55' may have been older is based on only one feature: the deterioration of the spine, which could point towards an older age (up to 60). The problem with that is that it could also be one of several signs of scoliosis, a potentially hereditary disease also attested in the bodies of Tutankhamun, likely his son, and his infant granddaughters. I don't suppose it's impossible that 'KV55' was a man of around 40 with the teeth and bone sutures of a 20-year old and the spine of a 60-year old, but since so much more evidence points towards the younger estimate than towards the older one (and even that can be plausibly explained away), I think it's unlikely. There is evidence in the archaeological record of Nubian children during the New Kingdom with scoliotic effects having the "spine of a 60 year old," so we know that scoliosis affects the spine in such a way that it is useless to "age" an individual simply by reviewing the spine. Further, I know from personal experience that if you have scoliosis, your spine always looks much older than the rest of your body. I was told in my 20's that from a x-ray view of my spine (I have mild scoliosis) that if the doctor had not known better, he would have guessed I was in my mid-50's to 60's. 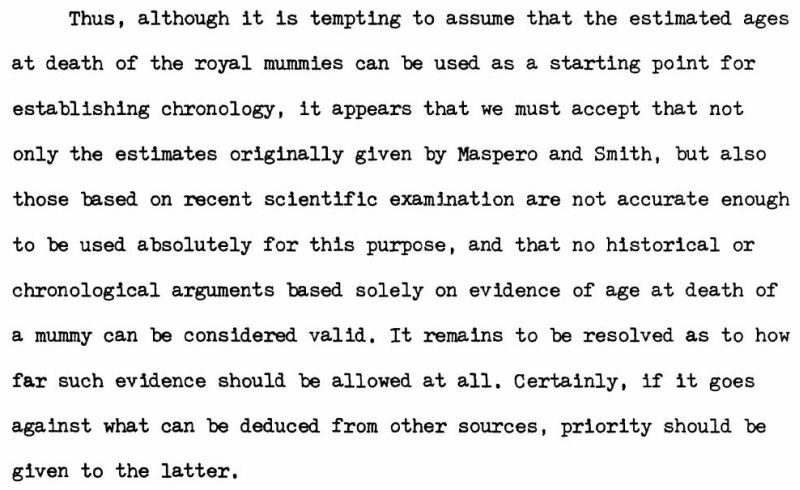 Harrison's 1966 review of the skeletal remain of KV 55 was quite comprehensive, which is why the age at death being determined in the early to mid-20's has never successfully been refuted, IMO. A second examination in 2000 confirmed Harrison's conclusions, and to date, even the speculation by Hawass, Gad, et. al (2010), based strictly on the "spinal degeneration" arguing for an older age of death, has never gotten much traction. Hawass, Z., et al.2010. Ancestry and Pathology in King Tutankhamun’s Family. (eSupplement). Journal of the American medical Association 303/7: 1-12. "... Dr Baker questions the accuracy of our CT-based age determination for the KV55 mummy. CT technology allows a more accurate age determination and depicts bony landmarks more precisely than in previous studies that used inaccurate and vague age estimation methods (and also failed to detect various pathologies of the KV55 mummy described in our study). The cancellous bone distribution of the femur and humerus heads; epiphysis ossification of the vertebrae, long bones, and iliac crests; and osteophyte development on many of the vertebral end plates are typical of an age at death of 35 to 45 years, ruling out the much younger age suggested by Baker. ..."
My apologies, Lutz, but I am not sure whether you're agreeing with the older age estimate or disagreeing? I find this stuff difficult, but I am no scientist. I wonder why the later folk doing the ct scans weren't aware of the issues regards condition like scoliosis? Or, Lutz, are you saying that the modern ct scans can see more and can detect an older age even taking scoliosis into account? All investigations carried out before 1968 (?) were purely "by hand", by visual inspection and with centimeter measure. In 1968 (Harris, when I remember rightly ?) were made for the first time x-rays of the reconstructed skull. CT-scans of all the obtained bones from KV 55 (and from some of the royal mummies of the 18th & 19th Dynasty) were made for the first time by Hawass at.al. That ct scanning, with the possibility of a virtual 3d reconstruction in the computer, is a completely new quality in comparison to visual inspection, measuring by hand and x-ray should probably be clear to everyone? All archaeological findings / documents / notes from / in KV 55 speak for Amenhotep IV / Akhenaten. There is not a single one among them which allows to identify the bones with a king named Semenchkara (or any other). To be honest, except for the issue of age, everything I've read about the tomb says to me that Akhenaten is the mummy. I made an enquiry elsewhere on this forum about the DNA regards KV35YL and KV55 mummies. Not sure if folk have missed my post, or no one knows the answer to my question. But I'll ask again just in case, though take the opportunity to rephrase the question. With close family interbreeding, can DNA examinations regards parentage satisfactorily make distinctions between sibling relationships and Father-Daughter relationships? I am also not an expert in DNA, just school and general education ... But I would say when analyzing modern samples, where all the necessary information in the laboratory can be exact and sure determined, it should be possible? ... Based on the partial Y-chromosomal information on the amount of autosomal half-allele sharing and family trio likelihood calculation, the most plausible 5-generation pedigree was constructed. ..."
As I understand this, it is a possible interpretation of the incomplete data, which were partly supplemented by probabilities and by statistical methods? A further one would then probably be the one from Gabolde, who goes out of cousine / cousin (and is in specialist circles, as far as I know, so far not contradicted?). Just a thought. Could partly explain Meritaten's presence in contexts relAting to Tutankhamun and throughout Akhenaten's reign????? Evidence for an older age of the KV55 bones rests additionally in arthritis found on one of the knees. See "Identifications of Ancient Egyptian Royal Mummies from the 18th Dynasty Reconsidered" by Habitch, et. al (YEARBOOK OF PHYSICAL ANTHROPOLOGY 159:S216–S231 (2016). So it is not only the vertebrae arguing for an older age. The age of the mummy of Tuthmose III was also estimated to be 35-40 years of age by Harris (see "Wente EF, Harris JE. 1992. Royal Mummies of the Eighteenth Dynasty: A Biologic and Egyptological Approach. In: "After Tut’ankhamun. Research and Excavation in the Royal Necropolis at Thebes" pp. 2–20"), and this also fails to add up to the 53-54 year old reign of the king. I cant remember where I read that the Ramesses II mummy was also the subject of an age assessment error, as 10 or so years from the recorded reign was missing from the alleged age of the mummy (maybe in Hawass' "Scanning the Pharaohs" (2016)?". There is either something very wrong with past studies of mummies, or Robins as quoted by Lutz was right in that we cannot know for sure how ancient people aged back then. Who knows, maybe teeth deterioration is only a modern standard due to current diets, and a person could age with what we now consider a 20 year old's teeth...I mean... back then nobody drank Coca-Cola or any other lab produced drink that makes your teeth yellow. I guess, until some more certain and maybe incontestable evidence comes forth to disprove the age according to the Hawass's camp, I'm happy to think Akhenaten is KV55 mummy. If not for he Age debate, there is far more evidence for Akhenaten than any other possibility available. The amount of speculation to posit Smenkhare being there is far higher and more imagination required as things stand. For me, working out who his sister is, that is, KY35YL, is the next step. For me at least. The possibility of it being a daughter, if so must likely Meritaten, is also something I'd like better information on. This DNA issue is fascinating. Also, the suggestion the blow to KY135YLs face may gave caused her death, in is intriguing issue too. Especially if you have that business about a Princess writing to the Hittite king asking for a son to be her husband.... That would have offended more traditional Egyptians. Ay? Just thinking aloud. All archaeological findings / documents / notes from / in KV 55 speak for Amenhotep IV / Akhenaten. Or Tiye, Kiya, Amenhotep III, or Tutankhamun. The archaeological evidence is such a mixed bag that it's hard to draw conclusions from it without some outside evidence to corroborate it. Besides, all it would prove is that the people working on KV55 thought they were dealing with Akhenaten. It wouldn't have been the first (or last) time a mummy was misidentified or misplaced by the illiterate workers. There is not a single one among them which allows to identify the bones with a king named Semenchkara (or any other). First, if we could (and again, I'm convinced we can) definitively rule out Akhenaten, what option other than Smenchkare is there? Second, if what the editor of KMT magazine was saying about the rediscovery of some gold foil pieces from the KV55 coffin (namely that two American Egyptologists confirmed to him on seperate occasions that they'd identified Smenchkare's cartouche on one of those pieces) is true, then yes, we do have a single one. But that remains to be (de-)confirmed, of course. Tiye and Amenhotep III are already identified by DNA analysis. Tutankhamun was found in his intact tomb. And the KV55 bones are of a male so Kiya is out. DNA and forensics evidence rules out all of the previously mentioned.